If you’d like to find out more about Campbell & Schmidt Cosmetic & Family Dentistry, reading reviews from our Lake Forest, IL dentistry patients is a great way to get to know us from our patients’ perspectives. Click the links below or read on to find out more, and don’t hesitate to give us a call if you have questions or concerns. Have you visited our Lake Forest, IL dental office recently? We’d love to hear from you. Click the “leave a review” link below to get started telling our team and future patients about your most recent visit to our office. Thanks for your time, and we look forward to seeing you and your family again soon. I am a newer patient of Campbell & Schmidt and I have been very happy. They always take the time to explain everything they are doing and the results of their examination. I have also found that they run on time — which is important to me as I am often going into my office after my checkups. Not only have I been impressed with their professionalism, they are also very nice and work hard to make the experience a pleasant one. Doctors Campbell and Schmidt rank at the top of my list of the very best in their profession. The entire experience for me starts with the friendliness of the ladies at the Front Desk: from scheduling an appointment, greeting me on arrival, and the final checkout process. Everything in between from a simple cleaning to the two crowns and numerous fillings I needed to replace over the past few weeks were done with extreme efficiency, painlessly and thoroughly to my satisfaction. I don’t throw praises lightly: especially for dentists. Like many people, I have had my moments of severe anxiety at the prospect of dental work. However, the Campbell & Schmidt team have minimized if not all together eliminated my white-knuckle days in a dentist’s chair. I highly recommend the services of Campbell & Schmidt, and feel fortunate to have stumbled into their practice about six years ago. I came to Dr. Campbell upon the recommendation of a neighborhood friend and now recommend him to anyone who asks. For the record, I have been with Dr. Campbell since I moved here from Boston, MA in 1989. I brought my family to him when they passed from the pediatric dentist and brought my second family and my husband to him when I re-married in 2003. Dr. Campbell is a terrific & caring dentist and his staff reflects those qualities as well, the mark of a great leader & a great staff. Thanks for giving me the opportunity to shine a little appreciation on Dr. Campbell and his remarkable colleagues. I’m writing to thank you for changing the way I think of going to the dentist. Before showing up at your office images of some strange smell, common to most dentist offices, combined with some shade of hospital green walls was the image that sent a message from my brain to my body, “Don’t go!” Now, I visit the coffee bar, gaze at the daily fresh flower display and read a copy of the wall street journal while waiting to be seen. Ahhh! After experiencing the soothing, relaxing, and home-like atmosphere combined with outstanding customer care, for me, going to the dentist is more like visiting close friends who care about me than a visit to a dental office. But I still haven’t mentioned the best part of my experience with you. As I was preparing for my wedding in Brazil, where I am currently living, you literally transformed my teeth both in terms of their health and appearance to make my wedding photos memorable — in a good way. From the yearly cleanings, which are done with outstanding care and excellence, to the need for more detailed work, I am ever grateful for your approach and methodology. Each time I had major work done, I received a call that evening to see how I was doing, which meant a lot to me living alone at the time. Thank you. I’m always thrilled with my experience. Time and time again Dr. Campbell and Schmidt set the bar in dental care. The staff is always professional, courteous and focused. One of the many things that set this dental practice apart from others is the people. They have a genuine passion for the dental craft and a commitment to continued education, using leading edge dental developments. I always go out of my way to recommend Dr. Campbell and Schmidt. Keep up the great work….You should all be proud of the very special practice you have built. Some folks may dread the idea of sitting in the chair at the dentists’ office. But at Campbell & Schmidt Cosmetic & Family Dentistry, the chair is a nice relaxing place to be. The technology they use makes it all but painless. The personalities in the office are all enjoyable and kind. The appointments are run rather efficiently. And the personal attention to detail is superb. Indeed, a nice experience in the dentist chair can be had. Dr Schmidt is a caring, conscientious, and friendly dentist. The practice runs very efficiently with timely appointments and a pleasant staff. Thank you for such quality dental care. About a year ago, I was lucky enough to be given the name of Dr. Campbell. From the first time I set foot in his office, I knew that I was in good hands. Everyone in that office was kind, friendly, and helpful. Over several months, I made repeated trips to Lake Forest that required an hour of driving. I knew that it was worth it, however, because I was getting such excellent care from Dr. Campbell and his assistants. Everything was explained to me in advance in language that was easy to understand. They used the latest technology, but they also showed lots of “old-fashioned” care and concern. For example, after I had some lengthy and potentially painful work done, I was amazed when Dr. Campbell called me at home that evening to make sure that I was all right. Dr. Campbell and his staff are determined to aim for perfection. I thought my retainer, for example, was perfectly fine, but it was not up to Dr. Campbell’s standards, so he sent it back to the lab to be reworked until he was satisfied. I went from being someone who hated her teeth to someone who is not afraid to smile and this is absolutely thanks to Dr. Campbell and his staff. Thank you so much for such wonderful care! I can’t thank you enough for your dedication, high standards, and kindness over the months of work that I had done. I’ve been a patient of Dr. Schmidt’s for the past 10 years, and couldn’t be happier about the work he’s done for me. He’s great at listening and understanding a patient’s needs, and then coming up with the best solution to their problem. Dr. Schmidt also goes above and beyond by contacting patients the day after they have work done to make sure they are not experiencing any unusual pain or side effects. Along with Dr. Schmidt, the entire office staff is also very friendly and accommodating, and great at getting back to me whenever I call with questions. Everyone at the office makes the whole experience as pleasant as possible. Most people go to see a doctor when they want to feel better, and I’m no exception. For the past 15 years, whenever I have a dental issue, I go to see Dr. Doug Campbell at Campbell & Schmidt Cosmetic & Family Dentistry. And I always feel better after I do! Twice a year, I go in for a regular checkup, which includes a dental exam, an oral cancer exam, cleaning and polishing, and (once a year) x-rays. The hygienists are skillful (as you would expect) and always friendly, and provide good tips on how to prevent cavities and maintain good oral health. I usually decline to watch TV during my visit, but it’s nice to have that option. I come out with a fresh, whiter smile, and feel good that I’ve had my teeth looked at by an expert before any major problems develop. I never need to wait more than five minutes for my appointment, and when I leave the office, it never takes me more than a minute or two to get a printout of charges that I can submit to insurance. I also get a copy for myself that has my next appointment on it. The reception area is clean and comfortable. Several years ago, I went through adult orthodontia. I was thrilled with the result, but my smile still left something to be desired. I had three problems, and I went to Dr. Campbell to get them solved. First, after two years of braces, I wanted to make sure my teeth looked their best, so I had them whitened. It took just one visit to Campbell & Schmidt Cosmetic & Family Dentistry to do it, and the difference was noticeable (and long-lasting). I was well informed about the cost, the time it would take, and what the procedure would be like before I made the decision to do it. I’m glad I did it! My second problem was that I had many old silver fillings that were not only unattractive, but some were also beginning to break down. I asked Dr. Campbell to take them all out, and he replaced them with tooth-colored fillings and ceramic crowns. Wow, did that make a difference! And he perfectly matched the color of everything, so now all of my teeth look completely natural, whether they are or not. This was truly exceptional work. Third, I still had a small gap that orthodontia couldn’t correct. Dr. Campbell solved that by doing some cosmetic bonding, and just like that, my problem went away. After many, many years, I finally had great-looking teeth to go with my smile! Whenever I see my orthodontist for checkups, he always comments on what a great job Dr. Campbell did with my teeth. My brother-in-law from Kansas City, who is also a dentist, says the same thing. My dental visits have not been solely preventive and cosmetic. Once, I had tremendous pain in one tooth, and Dr. Schmidt was able to accommodate me with an appointment the next day. After exams and x-rays, it was determined that I would need a root canal. From the stories you hear, I was worried that a root canal would hurt. A lot. But although it was a long procedure, it was a painless one, and Dr. Schmidt did a good job numbing me up without needing to knock me out. I left the office pain-free, and I now tell people that the bad part of a root canal is needing one, not getting one. I also appreciated that Dr. Schmidt called me that night to make sure everything was okay. I have needed fillings on occasion, and Dr. Campbell is meticulous at getting everything right, from drilling out the affected area, to getting the shade of the filling just right, to making sure that my bite is still correct. It’s important that teeth not just look good, but that they are functional. Dr. Campbell always makes sure that they are. Will bridgework, dentures, or implants be in my future? I hope not. But if I need anything, I know I will want it to be done perfectly, and that’s why I will be going to Campbell & Schmidt Cosmetic & Family Dentistry to get it done. P.S. Note that I was only asked to provide feedback. I wasn’t asked to say something nice, nor was I compensated in any way. The Campbell & Schmidt practice can be entrusted with your dental health. I have full confidence in their care. Over a number of visits, I’ve found the service to be capable, considerate, and accommodating to my needs. I would rate the practice among the most patient-oriented I’ve encountered. I recommend it highly. Our visits have always been quite comfortable and the children love going to the dentist. I’ve been seeing Doug Campbell ever since my father retired from the practice of dentistry. The office and professional staff at Campbell & Schmidt is always accommodating, friendly and professional. It makes a visit to the dentist an enjoyable experience. I love being able to watch T.V. from the dentist chair. It is almost like having a relaxing morning at home. I’ve been a patient for many years and strongly doubt if I will ever go to another dentist save for Dr. Campbell leaving the state. The staff is without question, exemplary in every detail, and not least of all, the dental work performed on me by Dr. Campbell through the years has always made me grateful. I have him taking care of me. And get this…he’s even called me at home at night on a few occasions after having extensive work performed simply to check on me and to make sure everything is okay. Now what’s up with that? Pretty amazing doctor – to say the least! Today’s experience in having a filling replaced was a whole different picture, as compared to the same type of procedure experienced 50 years ago! Pain free (no tears), comfortable throughout. Thanks much for the job well done! Doug, you and Cassie are a great pair. I was most impressed that she seemed to know when it was her turn to step in for those essential elements to make the procedure run smoothly for both of us. Thank you, Doug, for the follow-up call. Sorry I wasn’t here to receive it. All is well. No discomfort whatsoever. Hope your week of training goes smoothly and is productive and satisfying. What wonderful things are happening in the field of dentistry! This is the most personable, professional and trustworthy office I’ve ever been to. Everyone knows me by name, and I trust 100% that all services I receive are not only necessary, but completely accurate. Follow up care is always timely. I would have to move VERY far away to change dentists! These next two are in response to a channel 5 newscast that showed Team Smile and had Dr Schmidt being interviewed. The entire team went to Bourbonnais, IL to donate a day of dental care to needy children from the town. We saw you all on the national news last night…we were so proud that you are our dentist…thanks for all that you do. You guys are terrific! It’s great to know that others, who are so desperately in need, had the opportunity to benefit from the best team in dental care. Keep up the good work! Compared to the UK (and we did have a good dentist there), your practice is far superior in every way! Thank you. Elizabeth and Dr. Schmidt are always wonderful! They are both very personable and professional. For more than twenty years Campbell and Schmidt Dentistry has served my family with impressive results. Doug and Dave devote enormous effort to remain on the cutting edge of the continuously changing advancements in their field. They have anticipated and prevented issues long before they’ve occurred, solved problems with impressive insight and have never given up on a challenge with anyone in my family. They have a superb network of specialists to call upon and their entire team – from the front desk to the hygienists – are exceedingly pleasant and accommodating. I cannot imagine our family being treated better or by any other dental practice. Over the years I have been consistently impressed by the professionalism of Campbell and Schmidt Family Dentistry, especially their commitment to using the most current treatment practices. I am always greeted with a smile and a friendly hello when I visit Dr. Schmidt’s office. The atmosphere is friendly, energetic, engaging and professional. These unique qualities in a dental office provide a positive, relaxed and reassuring experience. Dr. Schmidt and his staff are informative, proactive and have the most modern technology to provide superior service. They are the best! After many years of searching for a solution to correct serious structural dental issues, I was fortunate to meet Dr. Campbell. I had previously discussed my deteriorating dental situation with various dentists, oral surgeons and orthodontists. It was obvious that without a solution, I was a candidate for dentures, but not solution was forthcoming until I met with Dr. Campbell in 2009. I soon learned that Campbell & Schmidt had the people, technology, equipment and experience to tackle my situation in a way that I had not found elsewhere. After a number of consultations, we agreed on a complete dental reconstruction to correct my severe over bite and damage due to grinding. Please understand that this was a big job that required a lot of trust & commitment between the dentist, oral surgeon and patient. The entire process took more than a year. Dr. Campbell coordinated the initial oral surgery required before he could begin the reconstructive procedures that opened my bite by adding crowns to my existing teeth. I was amazed by the advanced technology & methods employed, but in the end, Dr. Campbell’s patience and skill were the key to success. It has been 6 years since my reconstruction was completed and I couldn’t be happier with the result. I continue to be a regular patient and I am always impressed by the quality of the team at Campbell & Schmidt and how professionally the office is managed. We love feedback in all forms! Especially when our patients take the time to send a handwritten note. 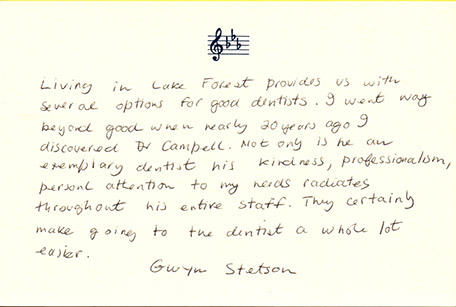 Thank you for letting us be your Lake Forest dentist!